The Mahindra Alturas G4 is available in 2 variants and 5 colours. 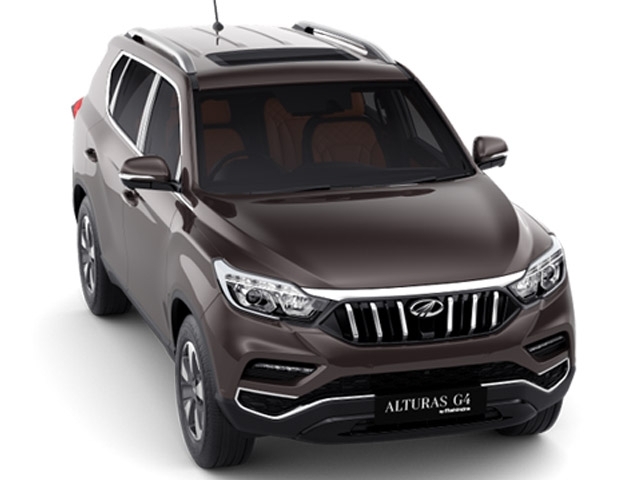 Here are more Mahindra Alturas G4 details such as prices, specifications and mileage. You can also check out the Mahindra Alturas G4 on-road price and EMI. Our detailed Mahindra Alturas G4 comparison further helps you compare the SUV with its rivals. DriveSpark brings you every Mahindra Alturas G4 information you would ever need. The Mahindra Alturas G4 showcases a bold styling and has a massive presence whilst on the road. It looks quite identical to the fourth-generation SsangYong Rexton on which it is based, except for some minor `Mahindra touches`. Up front, the six-slat grille of the Mahindra Alturas G4 dominates the rather sharp design elements. The headlamps are quite angular and chrome elements are limited to the right amount. The Mahindra Alturas G4 rides high from the ground and the side profile intimidates most other vehicles on the road. The 18-inch five spoke alloy wheels look elegant, while the global-spec Rexton get bigger wheel options. At the rear, the Mahindra Alturas G4 has a contemporary SUV-styling with the sharp-cut tail lamps and the thin chrome strip which joins them together. There is a neatly-integrated spoiler at the top and the bottom part of the bumper features a skid plate too. Inside the Mahindra Alturas G4, there is a good mix of leather, metal and good-quality plastic. The large touchscreen infotainment system is neatly tucked at the centre while a brown leather panel set its lower boundary. The seats are also well-designed and finished, offering great levels of comfort. The Mahindra Alturas G4 is powered by a 2.2-litre four-cylinder engine which makes 178bhp and 420Nm of torque. The power plant comes mated to a seven-speed automatic transmission which sends power to all four wheels (in the `4WD` variant). The Alturas G4 showcases commendable performance for its size. There is enough torque from the very low-end and the Mercedes-sourced transmission offers smooth shifts. The 4WD variant further gets three modes: 2WD Low, 4WD Low and 4WD High. Being a four-wheel-drive SUV, the Mahindra Alturas G4 has got enough off-roading capabilities. The high ground clearance and the well-put approach angle ensures that it can face almost any road conditions out there. The Mahindra Alturas G4 is not a strong contender in the fuel economy department; neither are its rivals. It roughly returns a mileage figure close to 12km/l. However, combined with a fuel tank capacity of 70 litres, the Alturas G4 promises a decent range. For the price, the Mahindra Alturas G4 comes loaded in terms of comfort, convenience and safety features. As standard equipment, the Alturas G4 gets nine airbags, ESP, ARP, HDC and the usual elements. Features such as dual-zone climate control, 360-degree camera and ambient lighting add to the list of things offered on the inside. The Mahindra Alturas G4 is a strong rival to the likes of the Toyota Fortuner, Ford Endeavour and the newly-launched Honda CR-V. It is a benchmark for all future Mahindra SUVs to come; be it in terms of styling, features, comfort or dynamics. Why couldn’t Mahindra sell it as the SsangYong Rexton itself and not as the Alturas? The previous-generation SsangYong Rexton has only 22% localisation while the new one (Alturas G4) is close to 70% localised. Furthermore, one of the main drawbacks (and reasons for the lack of success) of the old model was that ‘SsangYong’ was relatively unknown, even though it was sold only at Mahindra outlets. Is the 2WD variant of the Alturas G4, a front-wheel-drive SUV? No, the Mahindra Alturas G4 2WD is a rear-wheel-drive vehicle and is quite capable in its basic form.